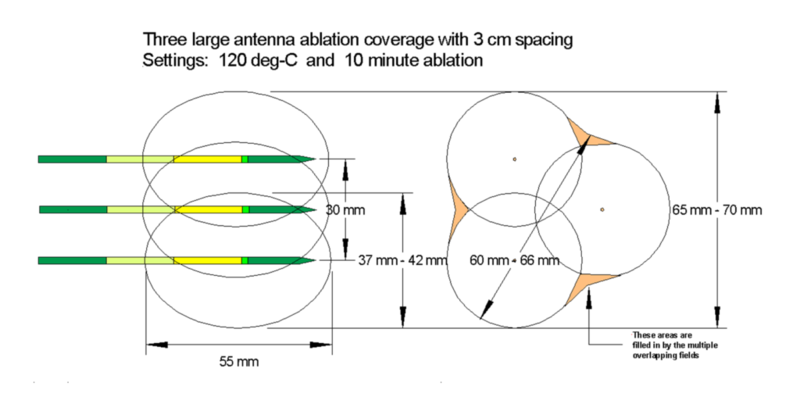 In addition, the MedWaves proprietary microwave platform technology enables you to customize the Ablation Zones to enable precise and safe control over the delivery of energy. 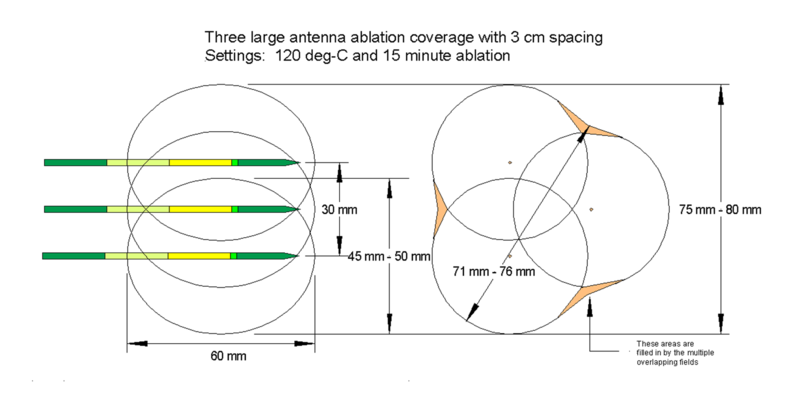 The diagrams below describe four (4) different configurations of ablation coverage in terms of spacing, temperature and duration. (Click on each image to zoom in for more detail). The MedWaves AveCure generator and probes have been used in a variety of applications. Please click the links below to see results delivered by MedWaves. Pre ablation image showing tumor and satellites nearby. During ablation image shows ground-glass effect of microwave coagulation in and around the tumor. Post ablation images at one month follow-up showing scar tissue with no tumor enhancements. The ablation was performed April 2009 and the patient has no signs of recurrence. Pre-ablation image showing tumor next to aorta growing front to back and top to bottom. 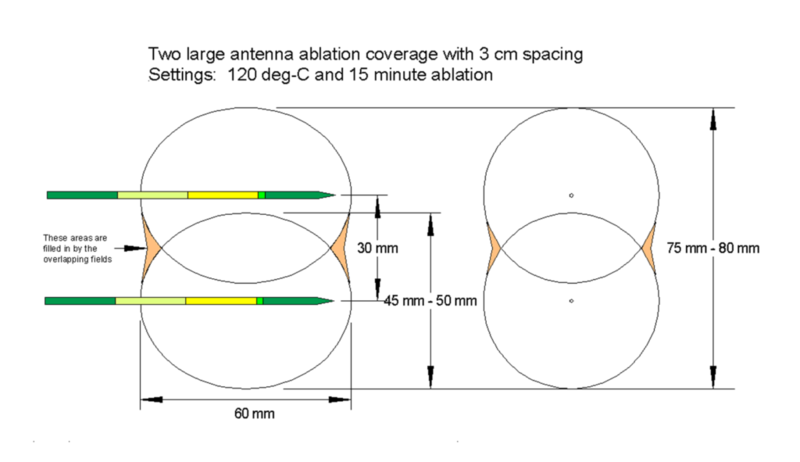 Pre-ablation image shows one of placements of antenna. Post-ablation image showing ground-glass effect of microwave coagulation in and around the tumor. Post ablation images at six months follow-up showing scar tissue with no tumor enhancements and shrinkage of tissue. Pre-ablation image showing tumor next to the hepatic veins. Post-ablation image showing ablation zone between the veins. Post-one-month-ablation image showing with shrinkage and no enhancements. Post ablation one month follow-up showing scar tissue with no enhancement and tissue shrinkage. Pre-ablation MRI T1W and T2W images showing the tumor in right femoral head. 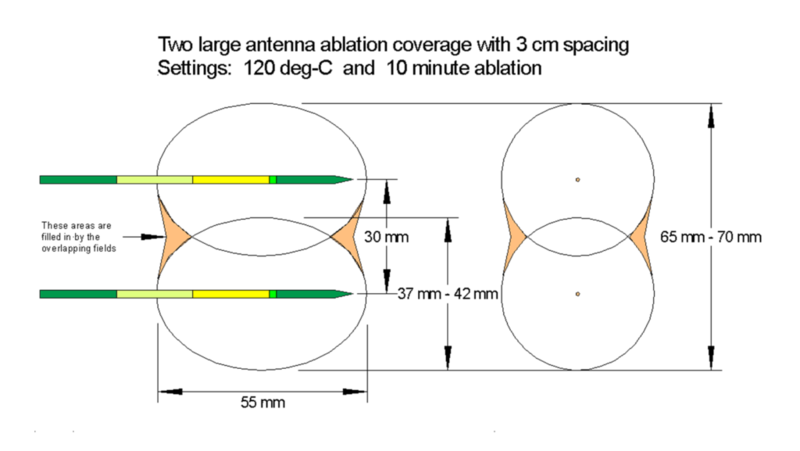 Pre-ablation image shows mini field antenna in position for treatment. Pre- and post-ablation dynamic MRI images show complete revascularization of tumor and ablated zone. Complete pain relief the day after ablation.